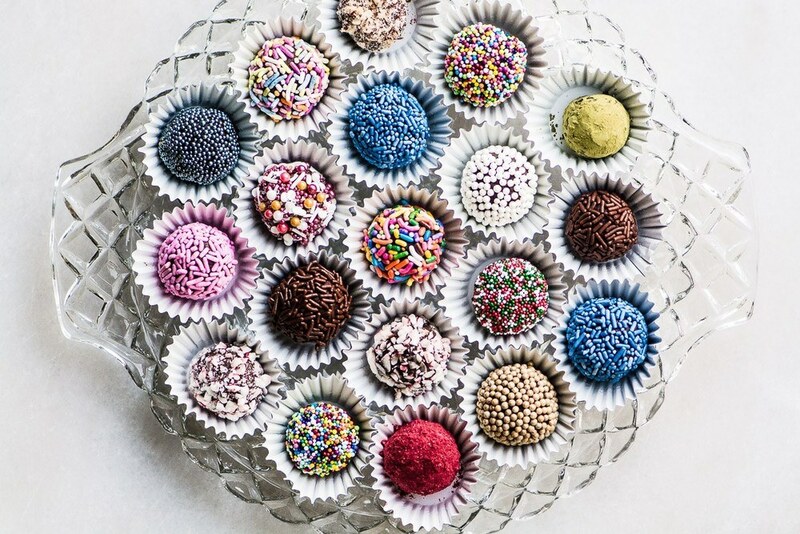 Jewel Box Truffles ~ I dare you to find a better holiday food gift than these adorable bedazzled chocolates. If you can melt chocolate, you can make them! Put the cream in a microwave safe bowl and heat on high until the cream comes to a simmer, about one to one and a half minutes. Add the chocolate chips and let sit for 5 minutes without stirring. Stir the chocolate and cream together until it becomes smooth and glossy. Any small lumps should eventually melt. If for some reason you still have lumps after stirring for a minute or so, then you can reheat the mixture VERY briefly in the microwave. (Sometimes if you just let the ganache sit for a minute or so more, the lumps will vanish. Cover with plastic and refrigerate for 2 hours. This allows the ganache to firm up enough to be scoopable. Using a small scoop, portion out the ganache and roll in your hands into a round, 1 inch ball. Immediately roll in your topping, gently tossing it around to get it completely coated. Set down on a tray or in a candy wrapper cup. I like to work in batches of maybe 5 or 6 truffles at a time ~ scoop them first, then roll them all, and then coat. Note: I find it helpful to have a damp towel and a dry towel handy to wipe my hands clean as I work. Refrigerate the truffles after they are all coated.